OUR KOALAS ARE IN CRISIS!. From habitat destruction and uncaring governments. ANE WE AIM TO STOP IT! 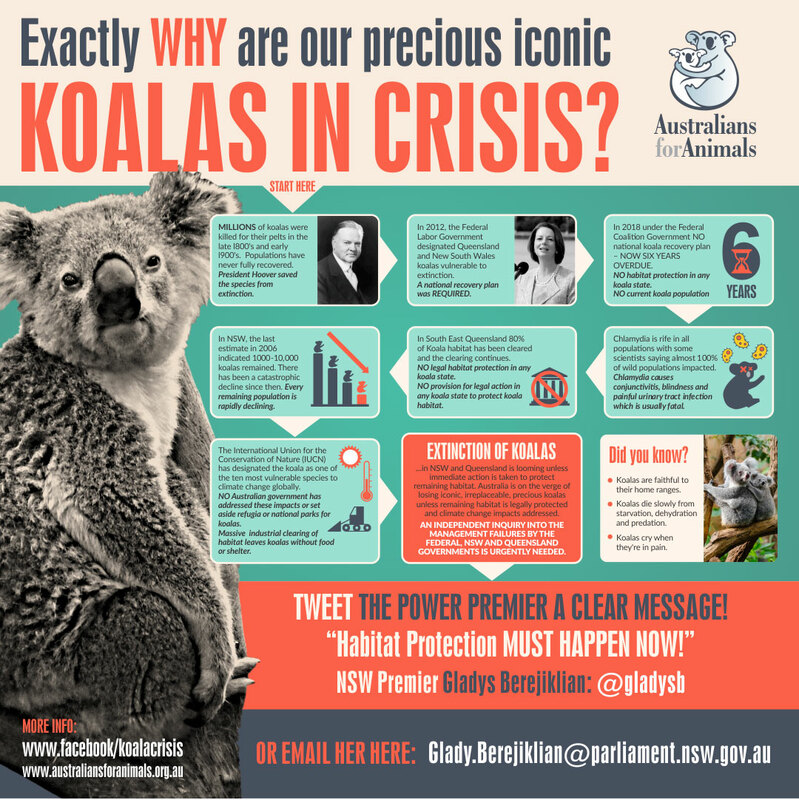 Australians for Animals aims to change that by harnessing people power to insist that our State and Fedaral Governments act urgently and decisively to protect Koala habitat. Learn how you can take practical steps to help to protect our precious Koalas from the very real threats they immanently face. Learn about what's been happening to our Koalas. It's not at all good, but if we work together; we can change it! Our coordinator is both tenacious and extremely angry! Read her assertion to the Senate inquiry on Faunal Extinction. Let's fix this together! Our reach extends into tens of thousands of concerned Australians weekly and almost 7000 engaged followers. But we need many more to make a real difference. Please join the movement by following us on Facebook. PLEASE SHARE THIS INFOGRAPHIC FAR AND WIDE. Nothing happens in isolation and the reasons why our precious koalas are currently in crisis extend back in time to the early 1800's. But to this day the power brokers are yet to acknowledge openly the imperative of protecting what is arguably one of the most iconic Australian animals from extinction. Let's not leave it up to them! Please share this infographic to let your people know what's happening and ask them to join the movement. You will note here that AFA has been advocating for Animals for a very, very long time. We are the ultimate 'early adopters' of Animal Protection. Now! Our focus is on saving our Koalas from extinction. It is unimagineable that their extinction would even be a considered reality. But sadly it truly is. Yet if we come together and fight it! If we stand together and SHOUT! We CAN change it! Q: Do you support the urgent introduction of legislation in NSW and QLD to protect Koala Habitat? It seems you overwhelmingly do; according to this national poll by IPSOS. A whopping 80% of you said YES!